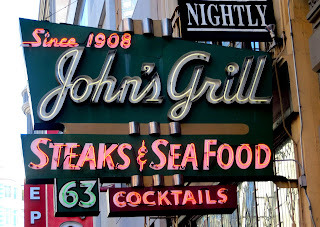 John's Grill is a classic old (105 years) steakhouse and, as the signage, menus, glasses, and decor are continually reminding you, was a haunt of Dashiell Hammett and a setting for "The Maltese Falcon." Indeed, a copy of prop from the Bogart movie was obtained by the owner, stolen from the restaurant, and then replaced by a copy of the copy (of the copy). You know what you're getting at John's -- essentially what you would get in any good, old-fashioned, formal steakhouse -- and the staff are friendly and efficient. 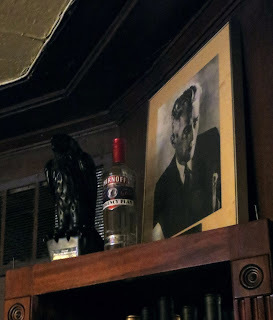 I also has a pleasant time chatting with Carla, whom I met at the bar, and it did indeed rather seem like Sam Spade could have slipped onto an adjacent barstool at any time.